Many years ago I won a copy of the cine projector release of this film and have been waiting for our family projector to get into a fit state to be able to watch it. Having finally got around to seeing it I’ve now found out that the Gospel Films Archive have released it on DVD (along with I Beheld His Glory (1952) and the 1949 film Ambassador for Christ from Cathedral Films’ “Life of Paul series) so it’s available to view for considerably less hassle than I had to go through. The film itself dates from 1942 which puts it in that early talkie period when very few companies were making Jesus films were made. 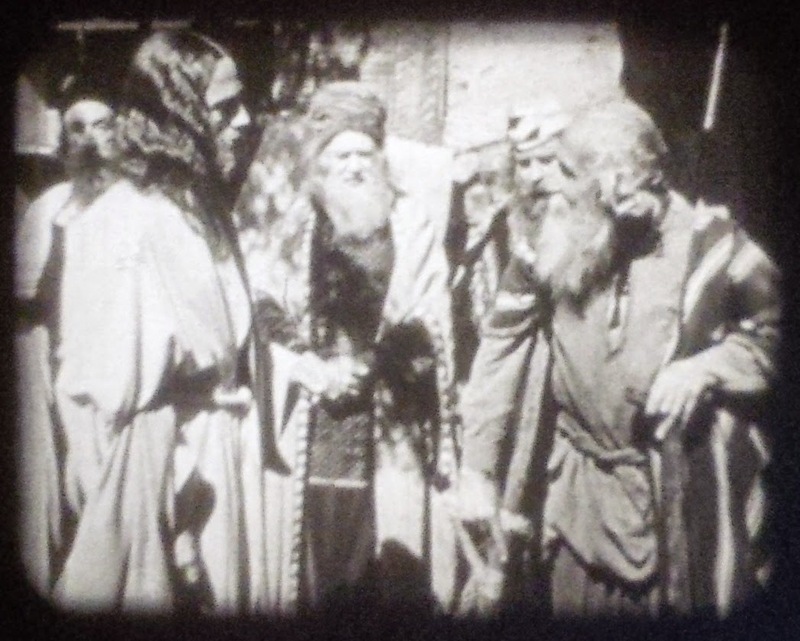 One of the major exceptions was Cathedral films who also made other early, sound-era, Jesus films such as The Great Commandment (made in 1939 but not released until Fox did so in 1942) and Child of Bethlehem (1940). 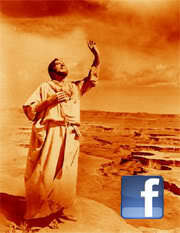 Like those films No Greater Power was produced by Rev. 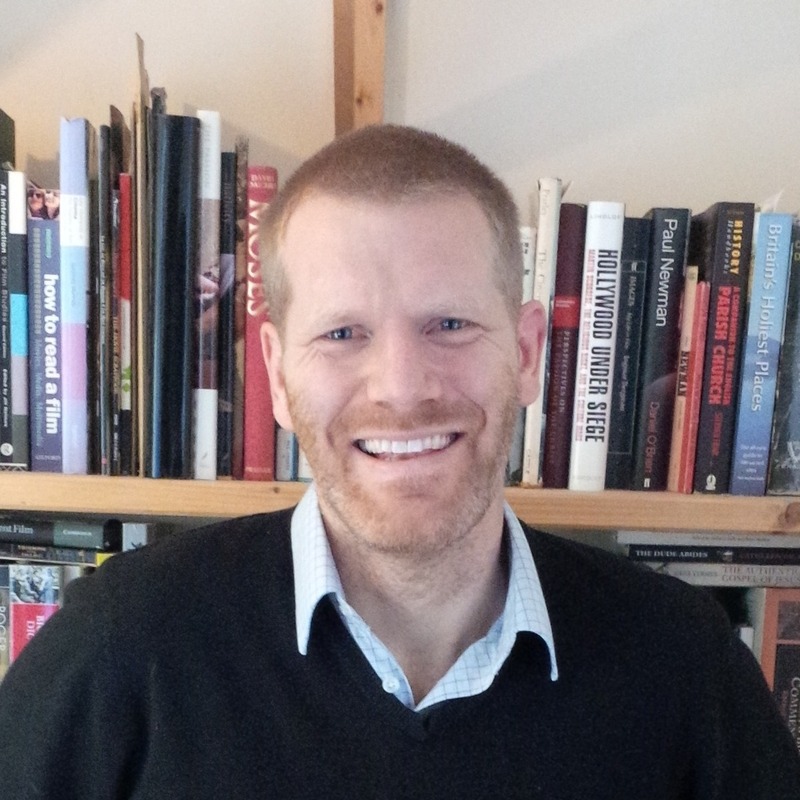 James K. Friedrich who also co-wrote it with Robert Edmunds. Friedrich’s regular collaborator John T. Coyle directed, a partnership that would produce a vast body of Bible films in the years to follow. 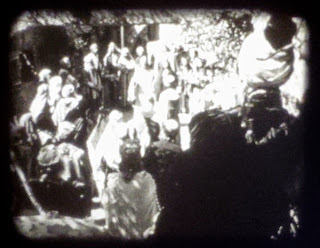 The film starts, somewhat unusually, with a man and woman arriving in what appears to be a rural village. As she is pregnant and riding a donkey it’s natural to think of the Nativity and to wonder how these images will fit with what we have already been told is the story of Zacchaeus, particularly as the couple are searching for somewhere to stay the night. Further unexpected twists are to come: We meet Zacchaeus, but he’s only a down-on-his-luck potter; the couple are not married but brother and sister; and it emerges that the man of the couple, rather than Zacchaeus who is the tax collector. Initially Zacchaeus turns the couple away. He already has some financial difficulties and offering hospitality to a tax collector is bad for business such is the feeling of hatred and the fear of spiritual contamination from his fellow townspeople. But then there’s a chance encounter with a pernickety Jewish scribe who forces him to destroy one of his pots when it momentarily comes into contact with a dead insect. Zacchaeus is infuriated and decides to reject the strictures of the Jewish law and offer hospitality, at a considerable price, to the tax collector and his wife. As the evening passes, the two men chat and the tax collector persuades Zacchaeus of the benefits of that particular profession, namely that there is money and power to be gained. When his guests leave, Zacchaeus enlists and a quick montage shows us him accruing considerable wealth. 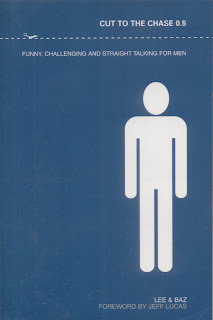 It’s clear though that his perceived rejection by his fellow townspeople, and his subsequent power and wealth have changed him such that whereas initially he was the kind of man who might be compassionate towards strangers in town, he is now motivated almost solely by profit. So it is that we arrive at the story from Luke’s Gospel. Later on Cathedral Films’ offerings tended to adopt a more straightforward, point and shoot methodology, perhaps as the pressures of covering so much material in such a short period of time took precedence over more artistic concerns. Here however there are several notable shots and it’s not inconceivable that these were due, in part, to cinematographer John Alton who went on to greater things in Elmer Gantry and Robert Siodmak’s classic Film Noir The Killers (1946). 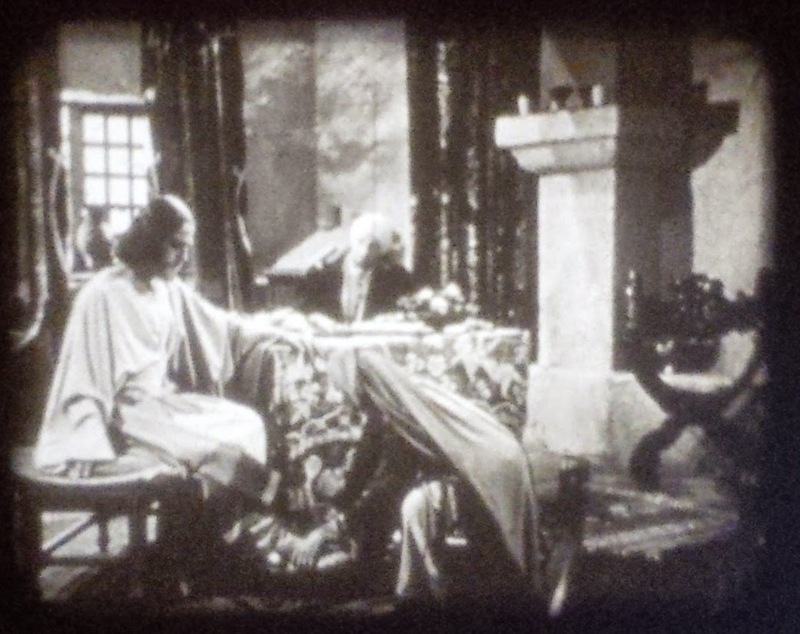 Perhaps it’s just the era, or the black and white photography, but it’s the Noir film that seems more closely related to Alton’s work here, particularly the interiors of Zacchaeus’ house, which is shot from a variety of high and low angles. 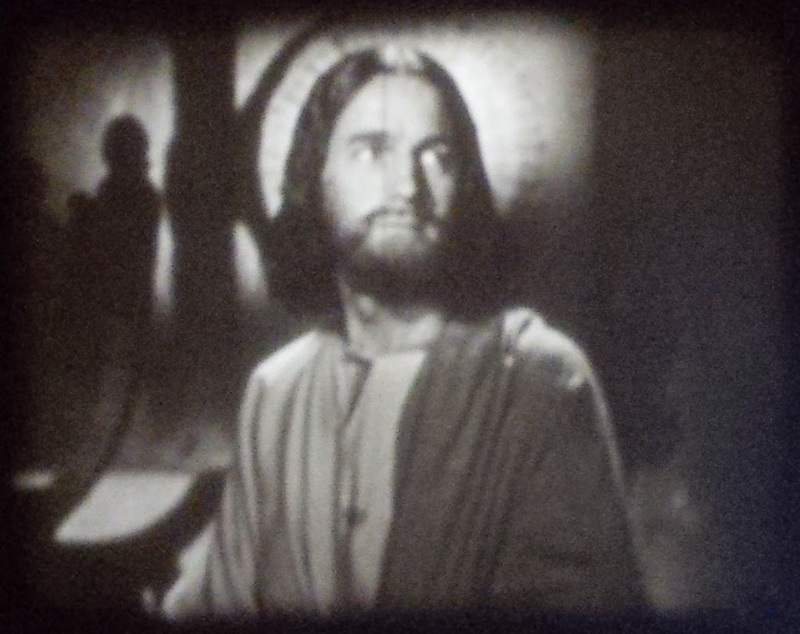 There’s also interesting use of light, not least the film’s most discussed shot (below), where backlighting forms a halo effect around Jesus’ head. Significantly our first shot of Jesus is taken from over Zacchaeus’ shoulder (below), not quite a point-of-view shot, but certainly suggestive of such. 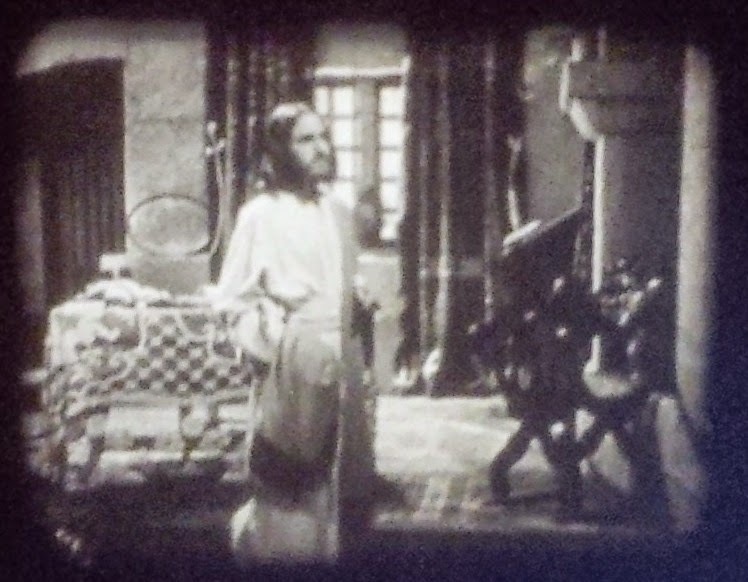 Jesus is a small figure in the background, distant, remote and cut off from the film’s eponymous anti-hero. 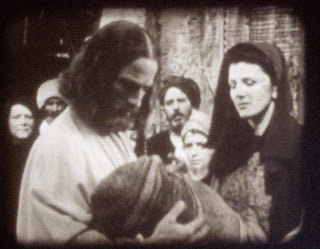 The audience is then privileged with closer shots of Jesus as we see him interact with some of the townspeople. There are blessings of children, and perhaps the suggestion of a healing. Here as well we’re given a brief sample of Jesus’ teaching, all of which comes from the Gospel of Matthew rather than Luke. 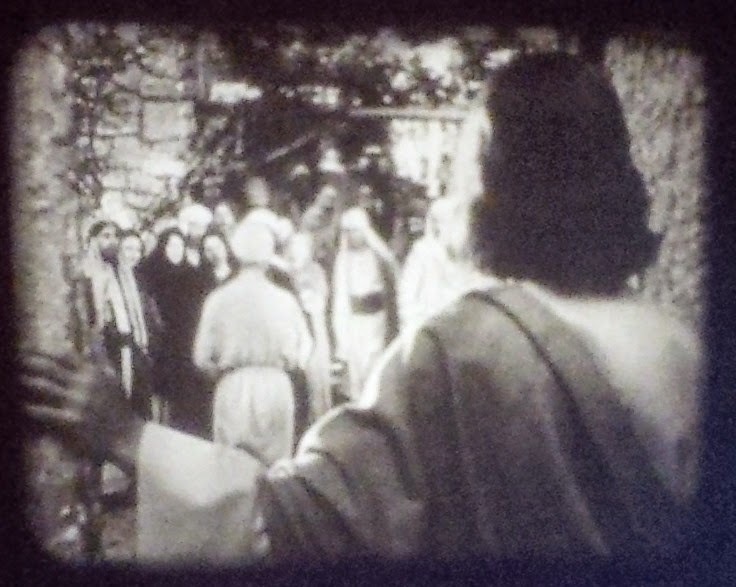 In the main it’s Matthew 5:43-48 (shown as intertitles in the cine release version), but the final line is Matt 5:20: "...except your righteousness exceed the righteousness of the Scribes and Pharisees, ye shall in no case enter into the Kingdom of Heaven." It's not entirely clear why the filmmakers decided that, of all the words of Jesus available to them, it was these that should be chosen here. The "love your enemies" passage from Matt 5:43-48 is conceivably the kind of thing that Jesus might have thought Zacchaeus's neighbours needed to hear, but did they think their audience needed to hear it as well? Given that this film was released the year after the United States entered the Second World War, it's hard not to think of that conflict in the background. And what of the use of Matt 5:20? To end on this passage - and to graft it onto a passage where it doesn't belong, in a story that neither passage belongs in suggests some kind of message intended for the audience. It's not long however, Zacchaeus gets to meet Jesus. From a theological angle it’s perhaps significant that this is very much a film about Jesus finding the sinner and not the other way round. Indeed the film brings out some of the more available metaphors in the story which are easily overlooked solely by reading it. Zacchaeus isolated and to, an extent, tangled in the tree. It’s reminiscent of Absalom and also of the tree in the Garden of Eden: neither connection had really struck me before. Jesus enters Zacchaeus's house and things largely proceed in line with the account in Luke 19:1-10, but there are more interesting ideas visually, not least the shot of one of the women of the house washing Jesus' feet. Zaccheus' wife had not been convinced about his career change, but was largely absent from the montage that charted his rise to power, but here she (?) takes the first active role in responding to Jesus, unwittingly aligning herself with the "woman of sinful life" from Luke 7. 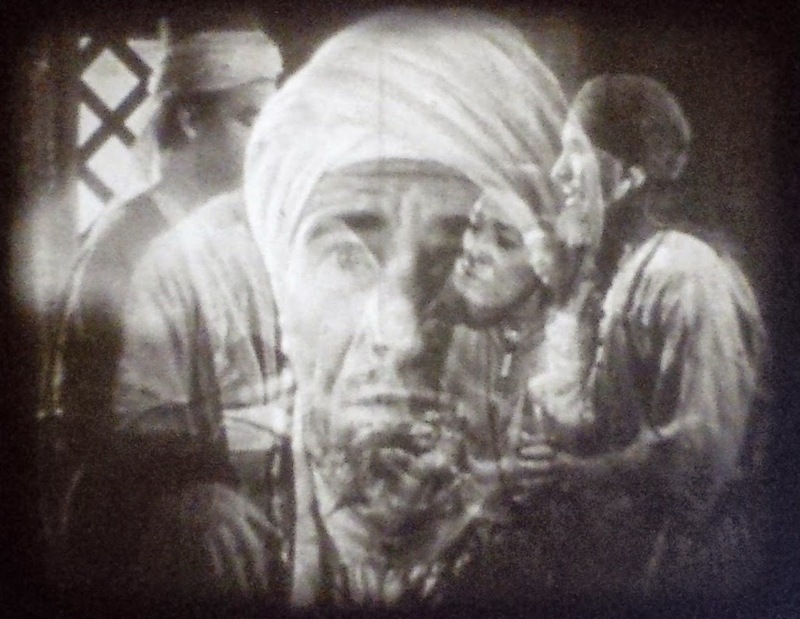 The moment of Zaachaeus' conversion is also portrayed interestingly, with a double exposure of his face overlaying a montaged flashback of earlier scenes in the film. Looking back it's easy to smirk at this shot which seems a quite dated by today's standards, but it's easy to forget that this film was made just a few months after the release of Citizen Kane, and only 12 years after Vertov's Man With a Movie Camera, of which it's most reminiscent. However, arguably the film's most satisfactory shot comes right near the end, as Zacchaeus leaves his house to return his ill-gotten gains to his victims. The moment (see below) is shot from inside the house, over the shoulder of Jesus who stands in the doorway. Zaccheus gradually diminishes as he moves towards the townspeople, gradually merging with them and so bringing the attention back towards his new Lord. It pairs perfectly with the shot over Zacchaeus's shoulder earlier in the film, suggesting both unity and, perhaps, substitution, with its connotations of atonement. It's a fitting end for a production that uses strong visual ideas and good filmmaking technique to elevate it above its humble origins.